Love it or hate it, mitzvah brei is one of those quintessential Passover dishes that people either love or loathe. Some soak the matzah in water before dipping it in eggs and frying it up… some not. Some people like it sweet, others like it savory. 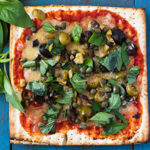 So, what’s the secret to the best matzah brei? As the old joke goes: two Jews, three opinions. Here’s the best advice I got from matzah brei fans all over the world. This is the most contentious step of making matzah brei: Do you soak it in water, or just let it soak in the eggs for a few minutes? Some people soak in water, then drain completely and continue frying. 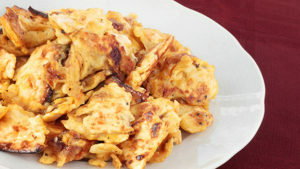 Others break the matzah into pieces, let it sit in the eggs, and then fry it up without the extra step of soaking in water. Either way, the matzah is going to need a few minutes to soak up some liquid, so don’t skip this. Once you pour the egg-matzah mixture into a well-oiled (or buttered) pan, just be patient. Don’t move it around, but rather let it get crisp on the bottom. Resist using that spatula too much! For the people who like it savory, try cooking some onions low and slow as the first step in butter or oil. You could also add some mushrooms and/or garlic. Once the vegetables have cooked long enough, add your egg-matzah mixture. Serve with salt and pepper. You could also add some turkey bacon or a dollop of sour cream (not together, of course!). Take a French toast-approach to matzah brei and add vanilla, cinnamon, milk, and a touch of sugar right into the egg mixture. Serve your sweet matzah brei with some combination of maple syrup, berries, powdered sugar, or whipped cream. 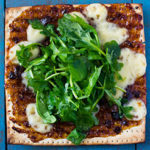 Try frying your matzah brei in schmaltz and then serve with a sweet jam. Now that sounds like the best of all worlds. 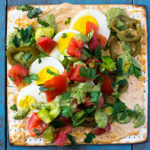 While the verdict may still be out on what the best matzah brei recipe is and whether it should be sweet or salty, sprinkled with salt or a healthy drizzle of syrup, one thing is for sure: Matzah Brei Eggs Benedict is a winner — great for a Passover breakfast or brunch or lunch or whatever. It’s topped with salty lox, perfectly poached eggs, asparagus and a healthy spoonful of creamy, homemade hollandaise sauce. This recipe is full of the bright spring flavors that we’ve been waiting for all winter. First, make hollandaise sauce. Add egg yolks, lemon juice and paprika or cayenne and blend together in a blender. While the blender is still running, slowly pour in melted butter until hollandaise forms. Taste for seasoning and set aside. Next, sauté asparagus with butter or olive oil over medium heat until just cooked through, about 3-4 minutes. Turn off the heat, but leave the asparagus in the pan for later. Place broken matzah in a colander and quickly run water over it to soften it, but don’t soak it – it will get too soggy. Squeeze any excess water out and add to 3 whisked eggs, stirring everything together. Season with salt and pepper. Return to the pan of asparagus. You’ll make your matzah brei in this pan, so add more butter if you think the pan needs it. Next, turn the heat to medium and pour matzah mixture into pan with asparagus. Use a spatula to scramble matzah brei and cook until desired preference (I prefer it to be crispier). Once done, transfer this to a plate and set aside. To make poached eggs, bring a pot with at least 2 inches of water to a gentle boil. Crack eggs, one at a time into a separate small bowl and gently pour eggs in, making sure they don’t touch each other or hit the bottom of the pot. Turn off the heat and cover the pot for 4 minutes. Once done, use a slotted spoon and place eggs on a plate lined with paper towel. 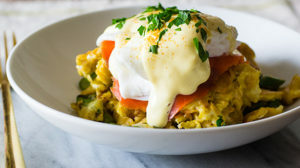 To assemble, top matzah brei with lox, poached eggs and hollandaise sauce and garnish with freshly chopped parsley and an extra pinch of cayenne. 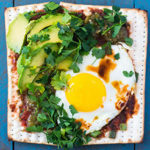 Avocado toast is trending…but matzah toppings is the new movement! Here are six different matzah toppings, each one from a different part of the globe. Fig and brie are a matzah match made in heaven. Top with a bright salad of spicy arugula with olive oil and lemon juice. Oui, oui! This matzah was inspired by my favorite Italian pasta dish, puttanesca, and is for the salt lovers at heart. A thin layer of marinara topped with chopped olives, briny capers, mozzarella and of course freshly torn basil! Since Thai is one of my favorite cuisines, this one was definitely my favorite. 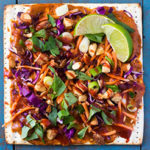 A curry spread with almond butter and coconut milk (which I dip in absolutely everything) is spread onto the matzah and then topped with cabbage, carrots, cilantro, roasted almonds and for even more kick…ci! Living in Southern California, Mexican breakfasts are a staple here. Eggs with avocado and lots of hot sauce is always the way to go. This is a play on huevos rancheros, with roasted tomato and tomatillo salsa, a perfectly fried egg, cilantro and of course, extra hot sauce! A spinoff of the popular sabich, matzah is spread with a thin layer of baba ghanoush and topped with chopped salad, herb tahini sauce, boiled egg and pickled jalapeno. Note: Tahini and sesame seeds are considered kitniyot and therefore not consumed by all Jews during the Passover holiday. 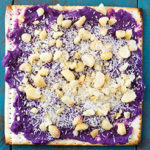 For a sweet matzah topping, I was inspired by growing up on the islands. Mashed purple sweet potato with coconut milk and topped with chopped macadamia nuts and shredded coconut. Directions: Before topping matzah, place matzah in oven at 350 degrees for about 10-12 minutes, to get it a bit more crispy and dry so it can hold the toppings well. This Passover, leave Egypt in style wearing “Matzahcouture” from Midrash Manicures (www.midrashmanicures.com).